There are words in the German language that are so idiosyncratic to “German” culture, behavior and circumstance that there is no adequate equivalent in English, therefore rendering them untranslatable and leaving them to be directly borrowed from the original language: “Schadenfreude” is one of those words, verbosely translated to “pleasure derived from misfortune of others“ or “malicious joy”. Or “Angst”, in English a psychological term, whereas the German original is an everyday word for fear. And it is fear that also lies at the heart of another neologism that the German language has spawned in recent years: the “besorgte Bürger“, which means “worried citizen”. A worried citizen in Germany, one of the most prosperous free democracies in the world, economic and political powerhouse of Europe, land of free higher education, low crime, compulsory healthcare, impeccable infrastructure and World Champions of football and export goods? What in God’s name would one have to worry about here? Nothing, if one looks beyond the superficial semantics of this seemingly harmless term und unearths the hidden bigotry and its downright racism behind it. The term “besorgte Bürger” is related to its predecessor “Wutbürger”, or “angry citizen”, and was originally used to depict left-leaning people protesting against the construction of a new central train station in the Southern city of Stuttgart, capital of Germany’s industrial heartland, where angry demonstrators were met with brute police force. 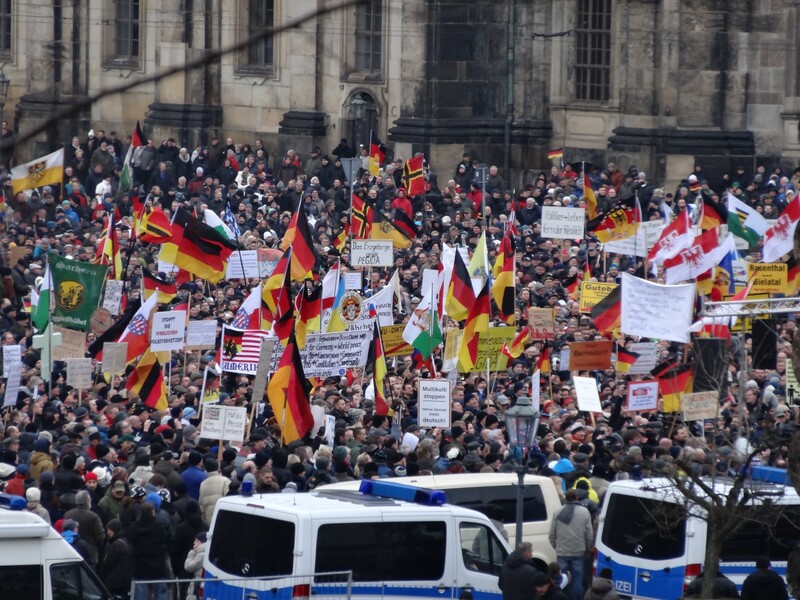 But the term’s semantic metamorphosis occurred during the birth of an anti-Islam movement in the city of Dresden in the East German state of Saxony, when a couple of years ago almost out of nowhere, thousands of people, their numbers rising exponentially, began congregating every Monday in the cultural capital of the East, calling themselves “Patriots against the Islamization of the Occcident (or PEGIDA, the German acronym). This movement with a complicated moniker whose weapon of choice in its battle against Islam was the exact opposite of complicated, namely crude essentialism, seemed ludicrous at first, but the steady numeric growth of these Islamophobes quickly began worrying politicians from centre to left, prompting them to invent the now classic catchphrase “Wir müssen die Ängste und Sorgen der Bürger ernstnehmen”: “We have to take the fears and worries of the citizens seriously.” Thus, the worried citizen was born, not an ecologically conscious activist anymore, but an anti-Muslim bigot (even though the two are not necessarily exclusive), a cipher for socially accepted racism in a country that likes to export the self-image of a tolerant and welcoming society. Most striking about the term is the casual juxtaposition of the act of worrying and Islam, the latter being the monothematic basis of the whole movement. Why was the diverse faith of over a billion diverse people in all corners of the globe worrisome to these people? There are so many things to worry about, from climate change to cancer, why worry about Islam, a generic term for something so utterly ungeneric? The answer is not passive, crippling fear, as the phobia in Islamophobia suggests and the dominant narrative always goes, but rather active hate, borne not only out of ignorance but also out of the almost religious belief of these predominantly agnostic people in white supremacy. Thus, at every PEGIDA gathering between all the German flags one would find the odd Norwegian flag, a tribute not to the natural beauty of Scandinavia, but to a country which — at least in the mind of the German racist — is considered to be one of the last refuges of white purity. But worst of all, the brandishing of Norwegian flags was meant to tacitly celebrate the white terrorist Anders Breivik, who killed 90+ people in Norway’s own 9/11 in 2011. Thus, the image of the worried citizen as a peaceful everyman is deconstructed to reveal your everyday run-of-the-mill racist, one who even openly supports mass-murder and mayhem. Furthermore, PEGIDA was an anti-Islam movement born in a region with the lowest numbers of Muslims in the country: the five Eastern German states, except for the big cities like Dresden and Leipzig, have virtually almost no immigrants, albeit Muslims. Even with the influx of Syrian and Afghan refugees since the so-called “refugee crisis” of 2015, this demographic reality still holds true: East Germany is predominantly white and non-Muslim. So what is there for the worried citizen to worry about? Yet the most worrisome side-effect of the term “besorgte Bürger“ is that it obscures culpability, subtly inferring that the worried citizen — who coincidentally is always white — is of an innocent altruistic disposition whilst the thing he or she is worried about — everybody non-white, Arabs, Muslims — is the culprit. And since the worried citizen is innocent, he is afforded empathy for his constant neurotic whining, while the object of his abstract worry is unsympathetically victimized. A good example for this unfair role reversal happened in the East German town of Clausnitz when a bus carrying refugees to their refugee center was intercepted by a mob of angry white (and drunken) residents. A Lebanese boy, clearly trying to defend himself against this vicious mob dynamic, kicked one of the agitators blocking the bus. The police, instead of arresting or charging the agitators, arrested and man-handled the petrified youngster, sparking outrage on social media and thus highlighting the racist law-enforcement culture in East German states like Saxony where it is the non-white victim who is routinely criminalized instead of the white perpetrator. And our politicians? Instead of renouncing the deplorable ideology of these racists they actually sympathize with these people. And by demanding for the subjective worries of xenophobes to be taken seriously, they are shockingly disregarding the concrete worries of non-whites in this country who are victims of racist bigotry and attacks on a regular basis, especially in Eastern Germany. The statistics are unambivalent: 47 % of all racist attacks in Germany were registered in its Eastern wing, even though it is home to only 17 % of the overall population. Resulting in the unfortunate fact that I myself, like many other non-whites who were born and raised in this country and witnessed its so-called reunification after the Cold War, still avoid visiting Eastern Germany due to security reasons. So who takes the worries of us non-whites seriously? PEGIDA has pretty much vanished by now, but the “besorgte Bürger” remains, finding his and her new political homeland in Germany’s first mainstream racist party, the “Alternative for Germany” (AfD), our own cute little version of the French Front National, but just as dangerous. The AfD — which began merely as an anti-Euro-currency party, founded by an economist with a pathological nostalgia for the old national currency Deutschmark and aversion to Greek bailouts as well as paternalistic dictates from Brussels, ultimately flew out of the Pandora’s box of its creator, incorporated PEGIDA’s regional islamophobia and went national with it. And since the so-called “refugee crisis” in Europe the worried citizen has once again gained further currency, prompting the AfD to include anti-immigrationism as a whole as its top priority on its death list of a party manifesto, next to the usual suspects of Islam and the EU. Currently, the AfD is steadily gaining momentum with the German electorate, successfully stealing votes from all established parties, from Angela Merkel’s centrist-left leaning Christian Democratic Union (CDU) to the leftist DIE LINKE who after the first landslide victories of their political antithesis were shocked to learn that for years their most loyal voters were not only not leftist, but right-wing and ultimately shockingly disloyal. Today, the AfD it is already sitting in 13 of the 16 state-legislatures and is widely regarded to make it into the German Bundestag in our upcoming national elections on September 24, which would be a historic first. The secret of its success: taking the worries und fears of Germany’s citizens seriously. Meaning: successfully playing devil’s advocate to a racist electorate. And while the traditional parties from center to left are desperately trying to cash in on the worried-citizen-fad by shamelessly pandering to these mainstream racists in order to galvanize the votes of this large electorate, other worried citizens for whom the bigotry of the AfD is not bigoted enough, have chosen other organizational means to vent their pent-up racism: such as the so called “Identitäre Bewegung” (Identitarian Movement) — a right-wing, vigilante version of Greenpeace — whose direct-action tactics recently led to them to charter a ship and go off to sea in order to stop refugee boats on their way to European shores. Or the 10,000- strong “Reichsbürger” (Citizens of the Empire) who do not accept the Federal Republic of Germany as a legal entity, but consider themselves citizens of the bygone German Kaiserreich, issuing own ID-cards and brandishing flags of an empire that was central in sparking the flames of World War I which turned Europe into a mass graveyard. Both groups represent German identity politics in its most reactionary and disgusting form. Worrying is a human thing, we worry about money, our children, growing old, health, security, the climate. But it is when worries turn into bigotry that they lose their justification, thus reducing them to solely a means to an end, and a very dangerous end at that. Unfortunately, the “besorgte Bürger” as a fixture of German society is here to stay, just as public discourse on immigration and Islam. But until the worries of many a worried citizen are not unmasked as the racist dispositions that they are, these merry-go round debates will truly be a never ending story. We in Germany — and elsewhere — need to see racism not primarily as a reaction to external factors (e.g. immigration or Islam) but an active political stance, a willful ideology based on the supposed supremacy of whites, and not on social or political happenstance for which the poor racist holds no responsibility. Like the aphorism “Guns don’t kill people, people kill people”, one chooses to be a bigot, and therefore the monopoly of decision-making lies entirely and exclusively in the bigots’ own hands and cannot be outsourced to third-party scapegoats like immigrants or Muslims. Thus, the so-called worried citizens of Germany should be rigorously exposed as the frauds they are: not worried citizens, but racist pricks.